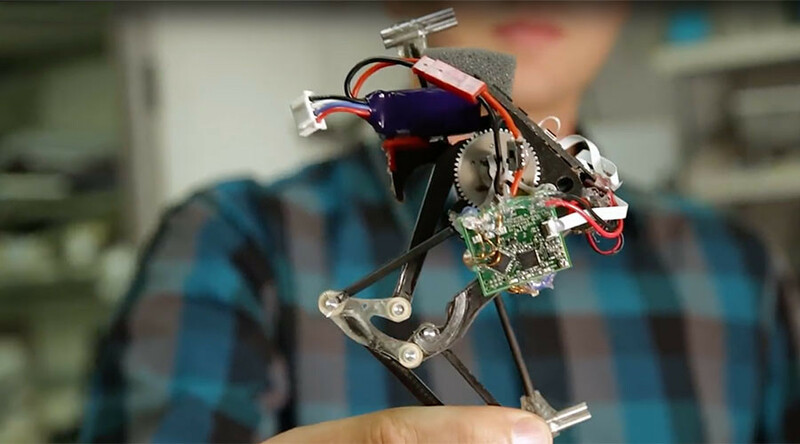 The ever-expanding array of tricks performed by robots now includes parkour, after engineers at UC Berkeley taught their bot to spring back off a wall while reversing direction. The robot is said to be the best in the world at vertical mobility. Called ‘Salto’ (short for Saltatorial Locomotion on Terrain Obstacles), the bot features a single leg with a spring mechanism, mimicking animals which enhance their movement by pre-loading tendons while in a crouch position and then releasing the extra energy in a jump. The team was inspired by the galago, a small nocturnal primate living in Africa that can be six to nine times more efficient at jumping than a frog. Standing 13 to 20cm tall, galagos are reported to be able to jump up to 2.5 meters vertically. Salto – which weighs 100 grams (0.2lbs) and stands 26 centimeters (10in) tall – has proved to be somewhat less impressive than the animal that inspired it, so far managing to propel itself up to 1 meter. Salto can though conduct several jumps in rapid succession – climbing 1.75 meters per second – and knows how to spring off a wall (a trick called a ‘tic-tac’ in parkour), boosting its jumping height to approximately 1.21 meters, Phys.org reports. So Salto can jump, but landing apparently still needs more work – the video shows the bot being caught mid-leap or falling into a safety net, but never landing on hard ground, whether on its foot or otherwise. The research, which the team reported on Tuesday in the debut edition of the journal Science Robotics, was funded by the US Army Research Laboratory. The authors say their robot can be used as a surveillance craft able to navigate difficult terrain in disaster areas.